Justice in the Classroom is a series of educational programs designed to enhance the teaching of civics, history, and government for our nation's children and people everywhere. Currently there are three programs available with Virginia Standards of Learning [SOL] lesson plans attached. The program begins with the tumultuous founding and evolution of our country and continues through the Revolution and the initial missteps in the creation of the new government under the Articles of Confederation. The program continues with the development of the Constitution with its checks and balances among three co-equal branches of government and the development of an independent judiciary operating under a written constitution that led to a country governed by the rule of law. The program encompasses Chief Justice John Marshall’s critical role as one of the nation’s Founding Fathers: a patriot, soldier, statesman, jurist. In his 34 years as Chief Justice, Marshall defined the role of the judiciary and established the Constitution as the supreme law of the land. Very detailed lesson plans and useful instructional strategies to use in presenting information to students. Videos were very engaging." Justice in the Classroom | The Rule of Law is a discussion of the concept of the Rule of Law and how it is an integral part of our governing systems in America. Through this standards-based curriculum, middle and high school students learn the fundamental political principles that define and shape American constitutional government. Connections are made through activities like interpreting a political cartoon to illustrate that, under the rule of law and the Constitution of the United States, all individuals, including government officials, must follow the law. Hyperlinks are exceptionally user friendly in lessons." Justice in the Classroom | Judicial Systems - Federal and Virginia is a discussion of the Importance of the Federal and Virginia judicial systems and how they function. The program offers a standards-based curriculum for middle and high school students. Lesson plans discuss contemporary cases through primary and secondary source documents which illustrate the structures of both court systems and how they operate in our dual court system. 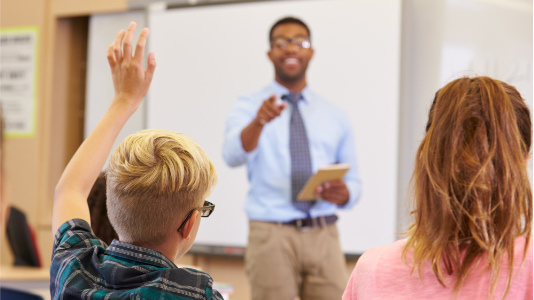 The lessons engage students by encouraging classroom participation through graphic organizers, activities like a gallery walk, primary source documents, web-based media, and pre- and post-assessments, all based upon national standards and Virginia Standards of Learning. These lessons are outstanding and I will definitely use them." Four years after winning independence from Great Britain, the United States of America adopted the Constitution. This revolutionary document became the instrument by which our government strived to preserve a young democracy. The beginning was shaky. There was no one, no group, who had the position, respect and power to interpret the Constitution. Disagreements ensued among political rivals and among the States. The future of this experiment in liberty was at risk. It took Chief Justice John Marshall to establish the Constitution as the supreme law of the land and bring balance to the government. John Marshall’s life reads like a “who’s who” of early American history. He was born in the wilderness of Virginia, was largely home-schooled, fought in the Revolution, spent the winter with George Washington at Valley Forge, served in the Virginia House of Delegates, persuaded the Virginia Convention to vote for ratification of the Constitution, served in the US Congress, was named Secretary of State by John Adams, wrote the first biography of George Washington, and served as The Chief Justice of the United States for 34 years. 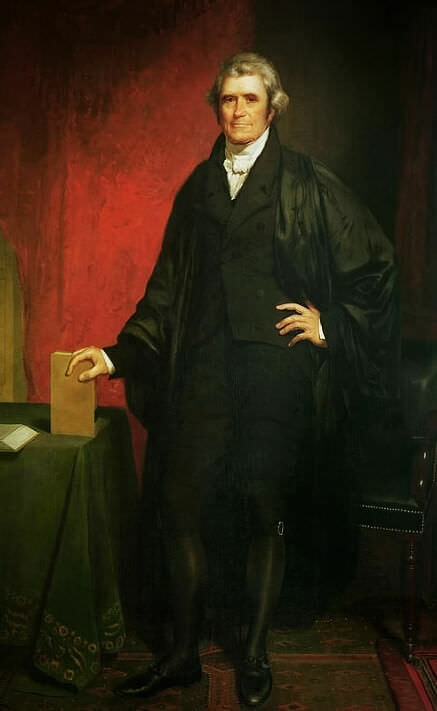 During his tenure as Chief Justice, John Marshall’s efforts to raise the stature of the Supreme Court and judicial branch to their rightful place as a co-equal branch of government, along with the executive and the legislative branches, were successful. This endeavor rectified a misalignment of governmental powers, filled a vacuum in setting supreme law, and permitted the Constitution to function as intended. Chief Justice Marshall’s pursuits assured the continued existence of the government of the United States, protecting the freedoms we so cherish. This provided new knowledge I was not familiar with. There are activities that can be adapted to other curriculum. The resources provided are wonderful and can be adapted as well." 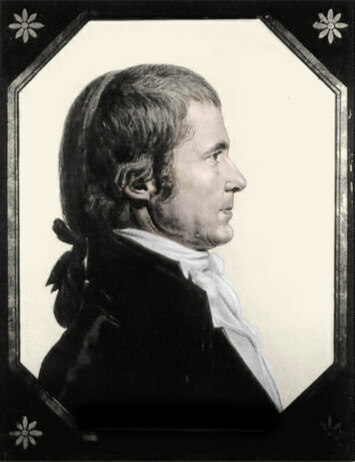 The John Marshall Foundation sponsors educational and public awareness programs related to history, law, and government that are designed to promote a greater understanding of Chief Justice Marshall’s role in establishing the American judiciary as an independent and co-equal branch of government, confirming the primacy of federal law under the Constitution of the United States and securing for a new nation the benefit of the rule of law. The Foundation’s award-winning Justice in the Classroom civics and history program currently operates in central Virginia, with planned expansion to schools throughout the Commonwealth and nation. Through philanthropy, the Virginia Law Foundation promotes law-related education, the rule of law, and access to justice throughout Virginia. The Foundation has provided over $24 million in support of the groundbreaking Rule of Law Project, the Court Appointed Special Advocates (CASA) program, Lawyers Helping Lawyers, and scores of other projects. Its many responsibilities include the oversight of Virginia CLE®, the non-profit, bar-sponsored provider of continuing legal education programs and publications. Justice in the Classroom was made possible by the generosity of the following and by other donors, large and small, who, like John Marshall, understand students should be taught to know, understand, cherish and value the rights and freedoms they enjoy. Contact The John Marshall Foundation about sponsorship. You have everything needed in one place! Great for new teachers! This is a model for how to package ready-made plans and resources." Justice in the Classroom is produced by The John Marshall Foundation. If you would like to make a donation and help expand this or other programs, click here.